Stefan Zweig, Marie Antoinette’s biographer, wrote of his heroine as “the most signal example in history in which destiny will at times pluck a human being from obscurity and, with commanding hand, force the man or woman in question to overstep the bounds of mediocrity.” The same could be said of Sophie von Anhalt-Zerbst, the teenage princess of a tiny principality bordering Saxony in Germany. Thanks to her maternal uncle’s betrothal to Elizabeth of Russia and his fateful death, young Sophie captivated the Empress, who selected her as the bride to her heir and nephew, Peter. All Sophie then needed were a wedding, Elizabeth’s death, an unpopular husband, and a bloodless coup to be installed as Catherine II. As Empress, Catherine ventured to westernize Russia by corresponding with philosophical stalwarts, Diderot and Voltaire, perusing Montesquieu and intending to entrench his ideas into her legal code, and importing thousands of magnificent art pieces by van Dyck, Rubens, and Holbein, to name a few. But most outstandingly, Catherine addressed an aspect of Russian life long neglected by her predecessors – public health. 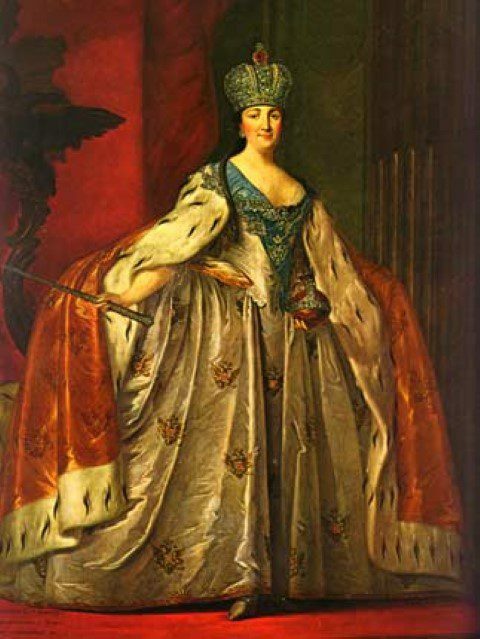 It came about that in the spring of 1768 Countess Anna Sheremeteva, the fiancée of the Empress’ principal minister Nikita Panin, caught smallpox (a disease caused by the variola virus that had “killed more people than any other microorganism”1) and died within a few weeks. As Panin himself underwent quarantine, Catherine remained in Tsarskoe Selo while waiting for reports of his recuperation. But across the rest of Europe, a novel yet divisive preventive process was gaining fame among the nobles and the bourgeoisie. Returning to Britain, Lady Montagu introduced the procedure to George I and his wife, Queen Caroline, who arranged for the inoculation of seven convicts and six orphans. Its success convinced George I to have two of his grandchildren undergo the procedure. This was a triumph, and inoculation before Jenner became the universal precautionary method against smallpox. Although variolation assured smallpox immunity and a death rate of only 1 to 2% versus a daunting 30% for those who contracted the malady in nature,2 it was never harmless. The patient could die from it, and the procedure itself could cause an outbreak. Despite these considerations Catherine summoned to Russia a Scottish physician, Thomas Dimsdale, to inoculate her and her son, the Tsarevich Paul. Concerned that the Russian smallpox might behave differently from the British, the doctor proposed that he should first try inoculating female commoners of her age. This the Empress resolutely refused. Dimsdale also requested that he could discuss the method with her court physicians. Catherine equally rebuffed the idea, regarding it unnecessary. But she agreed to wait when the Scot insisted he wanted to test the method on several young natives. Dimsdale’s declaration that Catherine’s inoculation was a success led to the subsequent variolation of the Tsarevich, 140 nobles, and fifty Muscovites. The founding of inoculation clinics in Russia’s largest cities, St. Petersburg, Moscow, and Kazan, followed. By the beginning of the nineteenth century, around two million Russians, including the Empress’ first grandson Alexander, had undergone inoculation. Catherine had no particular love for physicians. In fact, she reluctantly agreed on hiring a personal doctor, and seldom followed his medical advice. But in the face of smallpox threatening her subjects’ wellbeing, she overcame whatever private antipathies she possessed. Allowing herself to be inoculated when most monarchs would not have done so was a feat not even the valiant Frederick the Great would have considered. Robert K. Massie, Catherine the Great: Portrait of a Woman (United States of America: Random House Trade Paperbacks, 2011), 388. Massie, Robert K. Catherine the Great: Portrait of a Woman .United States of America: Random House Trade Paperbacks, 2011. SARAH I. IRAWA is presently employed at a transnational financial institution as a transitions analyst. Having graduated from De La Salle University with a degree of in Finance, she decides to pursue a career relevant to what she has taken up back in college. On weekends or each time she gets leave from work, Sarah commits herself to her hobbies – reading classical novels and history books and writing – the latter she esteems as the most pleasurable.